The Steven J. 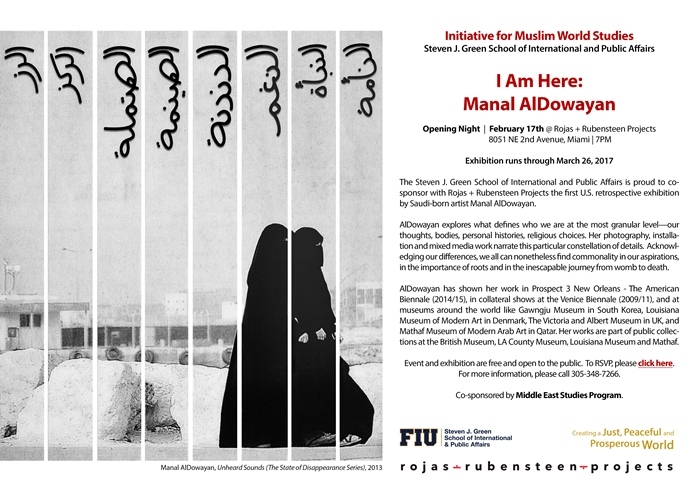 Green School of International and Public Affairs is proud to co- sponsor with Rojas + Rubensteen Projects the first U.S. retrospective exhibition by Saudi-born artist Manal AlDowayan. AlDowayan explores what defines who we are at the most granular level—our thoughts, bodies, personal histories, religious choices. Her photography, installation and mixed media work narrate this particular constellation of details. Acknowledging our differences, we all can nonetheless find commonality in our aspirations, in the importance of roots and in the inescapable journey from womb to death. AlDowayan has shown her work in Prospect 3 New Orleans - The American Biennale (2014/15), in collateral shows at the Venice Biennale (2009/11), and at museums around the world like Gawngju Museum in South Korea, Louisiana Museum of Modern Art in Denmark, The Victoria and Albert Museum in UK, and Mathaf Museum of Modern Arab Art in Qatar. Her works are part of public collections at the British Museum, LA County Museum, Louisiana Museum and Mathaf. Event and exhibition are free and open to the public. To RSVP, please click here For more information, please call 305-348-7266. Co-sponsored by Middle East Studies Program.